The Transfer of the Relics of the Holy Passion-Bearers, Princes of Russia Boris and Gleb, – in Holy Baptism Roman and David: – GreatPrince of Kiev Yaroslav the Wise (1019-1054) deeply esteemed his brothers, the holy Martyrs Boris (+ 1015, Comm. 24 July) and Gleb (+ 1015, Comm. 5 September). It was known that the murdered Prince Boris was buried at Vyshgorod near Kiev. And soon the holy relics of noble Prince Gleb were found at Smyadyno, not far from Smolensk, from whence they were conveyed on the Dneipr River to Kiev. The Kiev Metropolitan Ioann I (1008-1035) with an assemblage of clergy solemnly met the undecayed remains of the holy passion‑bearer and placed them in the temple of Saint Basil the Great at Vyshgorod, where the remains of the Martyr Boris were situated. Soon the burial place was glorified by the working of miracles. Then the relics of the holy brothers Boris and Gleb were removed from the ground and placed in a specially constructed chapel. On 24 July 1026 was consecrated the temple of five cupolas built by Yaroslav the Wise in honour of the holy martyrs. In the years following the Vyshgorod Borisogleb church containing the relics of the holy passion-bearers became the familial temple of the Yaroslavichi, their sanctuary of brotherly love and conjoined service to the "Rodina" ("Native-country"). The symbol of their unity became the celebration of the Transfer of the Relics of Boris and Gleb, observed on 2 May. The history of the establishing of this feastday is bound up with the preceding events of Russian history. On 2 May 1069 there entered into Kiev the GreatPrince Izyaslav, having been expelled from the princedom for seven months until this time (i.e. from September 1068) as the result of an uprising of the Kievans. In gratitude for God's help in establishing peace in the Russian land, the prince constructed, in place of the 1026 weather-decayed temple, a new church "at the summit all one". At its consecration there participated two metropolitans, George of Kiev and Neophyt of Chernigov, together with other bishops and hegumens and clergy. The transfer of the relics, in which participated all three of the Yaroslavichi (Izyaslav, Svyatoslav, Vsevolod) was set for 2 May, and affirmed as an annual celebration. Svyatoslav Yaroslavich, being prince at Kiev during the years 1073-1076, undertook an effort to transform the Borisogleb temple into a stone church, but he succeeded to raise up the stonework of the walls only to eight cubits high. And later Vsevolod (+ 1093) finished the church construction, but it collapsed by night. The veneration of Saints Boris and Gleb developed strongly during the era of the grandsons of Yaroslav, often producing a peculiar pious competition among them. The son of Izyaslav, Svyatopolk (+ 1113), built for the saints silver reliquaries, and the son of Vsevolod, Vladimir Monomakh (+ 1125), in the year 1102 secretly by night sent master craftsmen and finished up the silver reliquaries with leaves of gold. But the son of Svyatoslav, Oleg (+ 1115), outdid them. He was called "Gorislavich", and was mentioned in the "Tale about Igor's Campaign". He "intended to raise up the collapsed stone (church) and, having brought builders, he gave in abundance everything that was necessary". The church was readied in the year 1111. Having adorned it, Oleg "much pressured and besought Svyatopolk, so as to transfer into it the holy relics". Svyatopolk did not desire to, "since he did not build this church". The death of Svyatopolk Izyaslavich (+ 1113) brought to Kiev a new insurrection, which nearly killed Vladimir Monomakh, who had become greatprince in the city. Having decided to cultivate friendship with the Svyatoslavichi by a conjoined solemn transfer of the relics into the Oleg church, he made it known to Oleg and David (+ 1123). "Vladimir, having gathered his sons, and David and Oleg with their sons, all arrived at Vyshgorod. And all the hierarchs, hegumens, monks and priesthood did come, filling all the town and along the walls was not left space for the citizenry". In the morning on 2 May 1115, the Sunday of the Myrh-Bearing Women, they began to sing matins at both churches – old and new, and there was begun the transfer of relics. And during this there occurred a peculiar separation: "and they did convey in vehicles at first Boris, and with him went Vladimir, the metropolitan and clergy". After him on other vehicles they conveyed Saint Gleb: "with him went David with bishops and clergy". (Oleg awaited all in the church). This separation was adhered to in future generations. Saint Boris was considered an heavenly protector pre-eminently of the Monomashichi; Saint Gleb – pre-eminently of the Ol'govichi and the Davidovichi. It went so far as this, that Vladimir Monomakh in his "Testament", speaking about Boris, does not mention Gleb, and in the Ol'govichi lineage conversely, they gave none of the princes the name Boris. In general the names Boris and Gleb, and so also Roman and David, were esteemed in many generations of Russian princes. The brothers of Oleg Gorislavich bore the names Roman (+ 1079), Gleb (+ 1078), David (+ 1123), and one of his sons bore the name Gleb (+ 1138). From Monomakh were the sons Roman and Gleb; from Yuri Dolgoruky – Boris and Gleb; of Saint Rostislav of Smolensk – Boris and Gleb; of Saint Andrei Bogoliubsky – holy Saint Gleb (+ 1174); of Vsevolod BigNest – Boris and Gleb. Among the sons of Vseslav of Polotsk (+ 1101) – was the full levy of "Borisogleb" names: Roman, Gleb, David, Boris. The Vyshgorod sanctuaries were not the sole centre of Church liturgical veneration of the holy Passion-Bearers Boris and Gleb, it was spread throughout all the Russian land. First of all, there existed churches and monasteries at specific locales connected with the martyrdom act of the saints and of their miraculous help for people: the temple of Boris and Gleb at Dorogozhich on the road to Vyshgorod, where Saint Boris by tradition yielded up the spirit; the Borisogleb monastery at Tmo near Tver where the horse of Gleb injured its leg; a monastery of the same name at Smyadyno – at the place of the murder of Gleb; and at the River Tvertsa near Torzhok (founded in 1030), where there was preserved the head of Saint George the Ugrian/Hungarian [trans. note: the beloved servant of Saint Boris, beheaded to seize from his neck the gold medallion given him by Saint Boris]. Borisogleb temples were erected at the Al'ta – in memory of the victory of Yaroslav the Wise over Svyatopolk the Accursed on 24 July 1019; and at Gzena near Novgorod – at the place of a victory of Gleb Svyatoslavich over a sorcerer. The Ol'govichi and the Monomashichi vied with each other in the building of great‑cupola churches to the holy martyrs. Oleg himself, in addition to the Vyshgorod church, erected in 1115 the Borisogleb cathedral in Old Ryazan (wherefore the diocese was later called Borisoglebsk).And his brother David built likewise at Chernigov (in 1120). In the year 1132 Yuri Dolgoruky built a church of Boris and Gleb at Kideksh at the River Nerla, "where had been the encampment of Saint Boris". In 1145 Saint Rostislav of Smolensk "put a stone church at Smyadyno", at Smolensk. In the following year the first (wooden) Borisogleb church was erected in Novgorod. In 1167 a stone foundation replaced the wood, and it was completed and consecrated in the year 1173. The Novgorod chronicles name as the builder of the church Sotko Sytinich – the legendary Sadko. 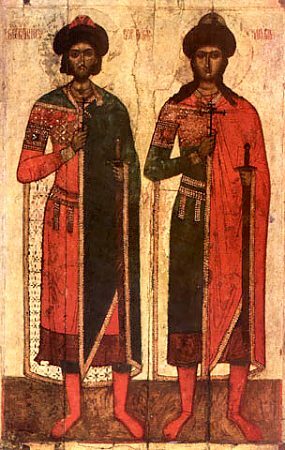 The holy Passion-Bearers Boris and Gleb were the first Russian saints, canonised by the Russian and Byzantine Churches. The service to them was compiled soon after their death, and its compiler was Sainted Ioann (John) I, Metropolitan of Kiev (1008-1035), which writings in the Meneion of the XII Century corroborate. The innumerable copies of the lives, the accounts about the relics, the miracles and eulogies in the manuscripts and printed books of the XII- XIX Centuries serve to witness the especial veneration in Rus' of the holy Martyrs Boris and Gleb. [trans. note: neither this account nor those of the individual feastdays present details of their acts of martyrdom. Perhaps it is assumed that the reader is well familiar with this, and perhaps the sublime poignancy and tragic pathos make it painful to recount. Rather than take up arms to defend themselves, or even just flee away to safety, both martyrs voluntarily accepted the passion of their suffering and death for Christ's sake, just as our Lord had voluntarily accepted His Passion of Suffering and the Cross and Death for our sakes – to which these holy brothers allude in their final prayers from the pens of the chroniclers. And hence the meaning of their unique title "Strastoterptsy" "Passion-Bearers"].